The Complete Book of Barefoot Running: Learn the Scientifically Proven Technique for Improving Your Stride and Reducing Injuries (a bit of a mouthful) is now available for pre-order and it looks like it'll be out in time for next year's Boston Marathon (18 April 2011). AND it'll be available in the UK, so no need to hunt the internet for a UK reseller or pay over the odds for shipping. 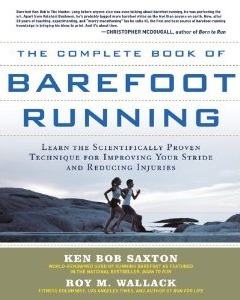 I think of all the barefoot running related books release since Born to Run, I think this one may be the most thorough and informative. After all, Ken Bob is probably the most experienced barefoot runner out there and experience counts for a lot. His website is a continual source of information for many runners, including me, so I've got high hopes of this book becoming my font of knowledge when I can't or don't want to access the internet to look something up.